The syndicated cartoonist for the Richmond Times-Dispatch brings you a collection of editorial cartoons that focuses on the first two years of the Clinton administration and the 1994 Republican election victories. Also included are drawings about general domestic topics, foreign affairs, as well as cartoons concerning Virginia and Richmond issues. 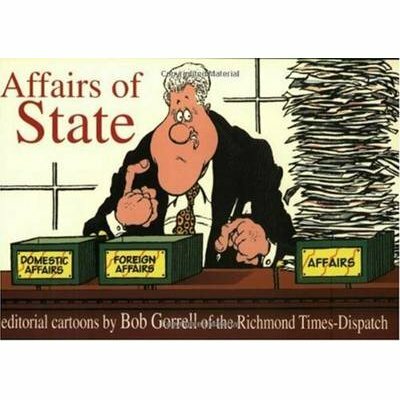 Affairs of State will appeal to anyone interested in politics in general and in the Clinton agenda in particular. After working for the Ft. Myers (Florida) News-Press, the Charlotte (North Carolina) News, and The Richmond News Leader, Bob Gorrell moved to the Richmond Times-Dispatch, where he has been since 1992. Distributed by Creatoris Syndicate, his work has been featured in Time, Newsweek, U.S. News and World Report, Business Week, National Review, and other prominent periodicals. Gorrellis cartoons have been used on CBS televisionis iFace the Nation, i and he himself has been a guest on CNNis iCrossfire.i His work has been included in numerous cartoon anthologies and has been cited for excellence by the Fischetti Editorial Cartoon Competition, the Overseas Press Club of America, the Dragonslayer Editorial Cartoon Contest, and the H. L. Mencken Awards. Born in Greensboro, South Carolina, April 6, 1955, he has been married to Pat Princiotto Gorrell since 1977. They live with their four children in Richmond, Virginia.